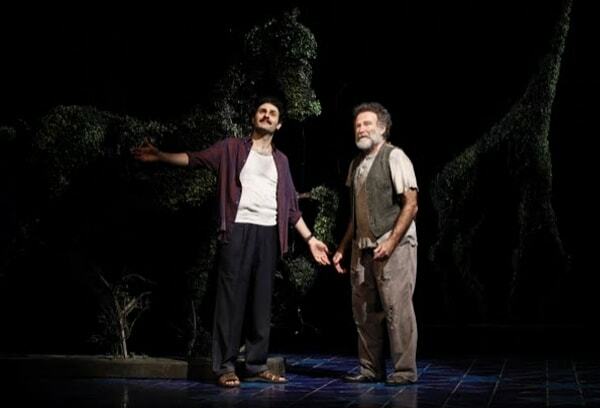 “This place is lousy with ghosts,” says the tiger, played by Robin Williams, at the top of the second act of Rajiv Joseph’s astonishing new play, Bengal Tiger at the Baghdad Zoo. I can tell you he’s not kidding. From the first scene of this fiercely original new work, it’s clear that reality will here be both heightened and blurred as the harsh realities of conflict and the dreamlike qualities of wartime hysteria collide in thrillingly unexpected ways. Set in Baghdad in 2003, in the thick of Operation Iraqi Freedom, Mr. Joseph’s play focuses on the collision of cultures inherent in this conflict, focusing not only on two young soldiers, Tom (Glenn Davis) and Kev (Brad Fleischer), but also on a topiarist-turned-translator named Musa (Arian Moayad) and the ghost of Uday Hussein, as well as a caged tiger (Robin Williams) who finds himself looming ominously over the proceedings after a particularly violent encounter with enemy U.S. soldiers. To fixate on the plot would likely spoil the excitement of experiencing its twists and turns unprompted. Suffice it to say, the stakes are high for all involved. Tom and Kev, guarding the tiger cage at the zoo, bite off more than they can chew by challenging their charge and end up in dire straits as a result. Musa, who was once the private gardener of the Husseins, crafting wildly imaginative animal-shaped topiaries out of plant life, watched his little sister suffer at the hands of Uday. After his death, Musa switched sides and became an interpreter for the U.S. Marines. At the heart of the play are emblems of power – particularly Uday’s gold-plated toilet seat and gun, which, following the assassination fell into Tom’s possession and into Musa’s. Tom, a fiery upstart of a guy, eventually loses his prizes and spends much of the play struggling to get them back. Taking for granted his status as a U.S. citizen, he considers himself entitled to these riches when he ought to view the items in context. Musa, by contrast, sees the toilet seat and gun for what they are – a tyrant’s last hold on his people. At the heart of the play is Robin Williams as the tiger, whose gruff, rough-and-tumble performance is unshowy and, consequently, deeply affecting. There are several moments of comic release when Williams is allowed to “do his thing” and elicit some laughs, but for the most part the popular comedian remains a committed unobtrustive part of an all-around top-notch ensemble. Glenn Davis as hot-headed Tom is all rage and impatience as he fights to get back what he lost, and Brad Fleischer perfectly embodies Kev, Tom’s dim-witted foil, whose eagerness outweighs his smarts. Also excellent are Arian Moayad, whose committed performance as Musa is one of the play’s highlights, and Hrach Titizian, whose Uday is dangerously watchable, alternating between charm and smarm at the drop of a tyrannical hat. Director Moises Kaufman, best known for heading up Tectonic Theater Project, which is responsible for The Laramie Project, has brought his assured hand to this production, which features impressively expansive sets designed by Derek McLane. Kaufman keeps the pace quick but isn’t afraid to give individual moments their due. With the help of David Lander’s lighting design, his vision for the piece makes efficient use of Baghdad’s shadows but also of its piercing shafts of light. Though Bengal Tiger is visually impressive, however, it’s short on gimmicks and effects. What’s at the heart of the piece is Joseph’s impressive Pulitzer-nominated script, and the convergence of elements that brings life to his words is worth an emotionally charged trip to the zoo.